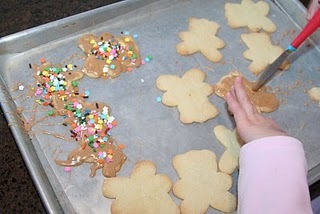 I have wonderful memories of making and eating cutout cookies at Christmas as a child. My mom would roll-out the dough and do all of the other hard work and my brother and I would do some decorating (but eventually that changes from fun to work and we would quit) and lots of eating. Cutouts, as we have always called them, take much longer than any other cookie we usually have at Christmas so in recent years with everyone working and little ones to take care of…there hasn’t been time to make them. This year I had vacation time available and I sent Juliana, Ruslan and Wyatt to childcare for a few days the week of Christmas. I made the dough and Mom came over to help. 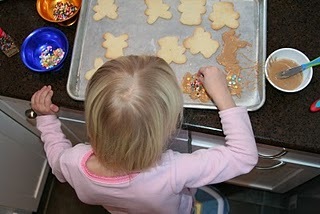 Actually, Mom still did most of the hard work – rolling and making every scrap of dough into a yummy shape. I was responsible for watching the oven and managing the cooling process. Since the cookies are only in the oven 6 minutes, it is difficult to make these without someone to help so you can have batches moving quickly. I baked cookies Sunday, Monday and Tuesday. Monday afternoon we made the cutouts. Tuesday I started frosting and decorating. And on Wednesday Juliana stayed home with me to help. I started her with one tray of cookies – she selected teddy bears and horses from all of the shapes available and brown frosting. 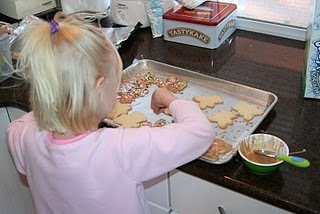 I set her up with the tray of cookies, bowl of frosting, 2 age-appropriate knives for spreading the frosting (that were dropped, washed and returned several times during the frosting), and 2 bowls of sprinkles. 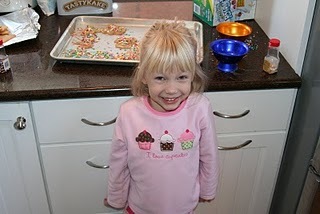 The bowls of sprinkles were refilled by request throughout the process, and she did use a lot if them. 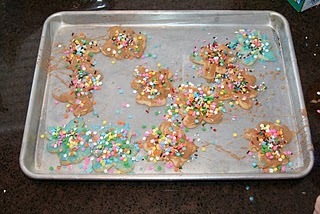 It was a messy and long process to decorate that tray of cookies. But it was just enough for her. When she finished the last cookie, she proclaimed herself done with frosting, washed up and went to watch Playhouse Disney while I worked on the other cookies. I hope that this is the start of happy memories of cutout cookies for another generation. She was very pleased with her creations and when she saw me taking a picture of the tray, she insisted that I take one of her with her cookies. 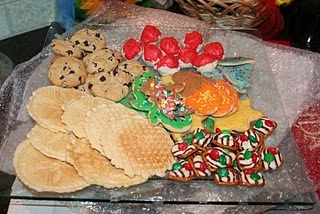 A tray of completed cookies including one of Juliana’s creations – yummy!